Every family has a unique make up, but one thing is unanimous among any household with children: chaos. Imaginative play times can leave a mess, busy schedules can lead to stress and exhaustion — doesn’t it just make you want to get away? Everyone needs a break from the day-to-day and an opportunity to spend time together as a family without distractions. A quick trip exploring a new place provides a space to bond and create new memories together. It’s hard enough to line up time off of work while maneuvering around after school activities, let alone find a destination that will make you and your wallet happy. We’ve compiled a list of 10 of the best places to take your family for a frugal weekend getaway. Want a taste of Europe without the hefty price tag? Visit the kitschy little village of Leavenworth. Nicknamed “Little Bavaria,” it hosts one of the largest Oktoberfest celebrations outside of Munich. While that may sound like an adults-only scene, there’s a wellspring of activities for the kids too: putt putt golf, sledding and tubing, skate parks, reindeer farms, hiking and more! The gateway to Yellowstone National Park, West Yellowstone is home to plenty of natural wonders. 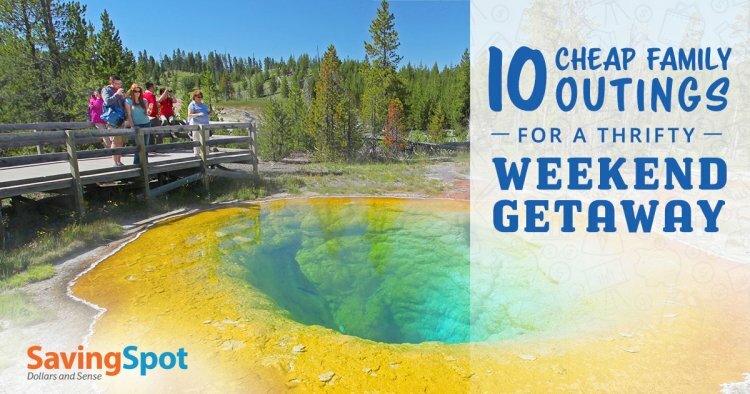 Visit Old Faithful or try white-water rafting down the famous Yellowstone River. Experience the unique opportunity to see wolves, bears and birds-of-prey up close at the Grizzly & Wolf Discovery Center. A perfect “all-in-one” destination for families, Phoenix has big city perks while hosting some of the best mountain hikes in the country. Come visit during spring training in March to catch your favorite baseball team play at a fraction of the cost. Visit the Phoenix Art Museum — the largest in the Southwest. Aim for the first Friday or the second Sunday of the month for free admission. This southern city lies on the Gulf of Mexico and is often written off as a college spring break town. While we would recommend avoiding this coast town during March and April, it’s not because South Padre isn’t a worthy destination — prices are heavily increased during that time. Visit in off-peak season and enjoy a less crowded beach or pick from one of the great activities offered at South Padre Island Adventure Park. The Silver Dollar City hosts a multitude of activities, all at an approachable price point. Start your adventure at Branson Landing, a vibrant boardwalk that hosts live music, entertainers, light and fire shows, and more — all are sure to entertain all ages. Head 30 minutes north of the city to the Ozarks where you’ll find a plethora of hiking trails and the Smallin Cave. The Wisconsin Dells have been a popular destination for Midwest families for years, but with that popularity comes a jump in prices. Lake Geneva is a great budget-friendly alternative just north of the Illinois border. Riviera Beach is located right in the heart of Lake Geneva, conveniently near their cutesy downtown area as well as Big Foot Beach State Park camping grounds. The “Heart of the Hills” is the perfect getaway for an adventurous crew. Nestled amongst scenic hiking trails and wonders of natural beauty, Hill City is close to Mount Rushmore and the Black Hills Institute — a dinosaur museum! Cozy up around a fireplace in one of the many affordable rental cabins and Airbnbs in the area. Our capital is the mecca of engaging (and free) museums. Explore all the hands-on exhibits the National Mall has to offer. From the history of space exploration to the plush gardens of the botanic gardens, there is a museum for every interest. The Smithsonian Museums, monuments and memorials, National Gallery of Art and the United States Holocaust Memorial Museum are all free. Museums that do charge admission usually host free community days throughout the month. If your kids are screen addicts, this may be the best choice to reconnect while you disconnect. Less than two hours north of Philadelphia, you’ll find Pennsylvania Dutch Country. Go back to a time before electricity and other modern conveniences. See lesser-known landmarks from early American history like the Lancaster Longhouse and the Hans Herr House and Museum. One of the best ways to minimize stress on a family vacation is to let the vacation plan itself. Once thought of as a luxury experience, all-inclusive hotels have gained popularity in the states. As such, the market is oversaturated and now all-inclusives are more affordable than ever. With hotel, food and water park admission all built into one price, all-inclusive family resorts may even end up being the cheapest option on this list. 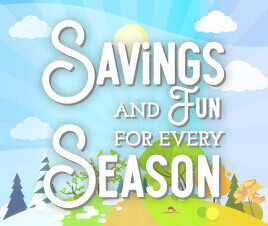 Do your research on sites like Groupon Getaways or Travelzoo for the best deals in your region.